Nothing is better than finding your true love and getting married or making a commitment to them. This happy occasion should be commemorated. 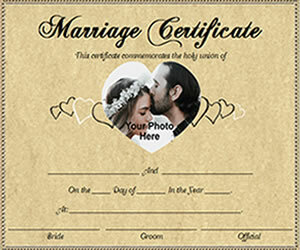 Below you'll find plenty of marriage and wedding themed printable certificates that you can print out for free. Besides marriage certificates, we have renewal of wedding vow certificates, certificates of matrimony, and certificates of commitment. Download them, print them out and save them for your memory book as a keepsake. If you want us to customize your information in the marriage certificate, contact us. Printable Green Certificate of Marriage - This blank printable marriage certificate template is a great way to commemorate your marriage. Blue Printable Certificate of Marriage - Commemorate your wedding with this blue framed marriage certificate. Free Printable Tan Marriage Certificate - This blank printable marriage certificate template with hearts is a great way to commemorate your marriage to your husband or wife. Sample Customized Marriage Certificate . Contact us to add your photo and information on the certificate. Our Printable Marriage Certificates are saved as Adobe PDF files. They are blank templates so that you can add your own text into. Simply open the marriage certificate templates up and print them out using your printer. Next fill in the information that is blank on the certificate template.